Patriots owner Robert Kraft has said he is willing to accept the punishment handed out to the team for the Deflategate scandal, but he does not speak for the fans, it seems. The Boston Globe reports that around 150 fans headed out to Foxborough to demand that the NFL "free" Tom Brady from the four-game suspension handed down by the NFL after the Wells Report came out. 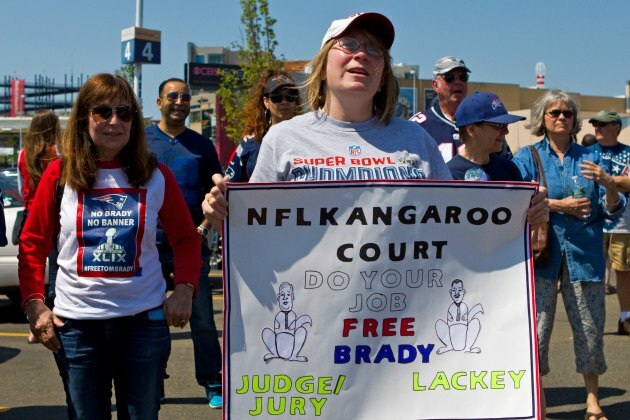 A pair of Patriots-loving newlyweds at the rally showed some serious commitment to the cause, swearing that they would postpone their honeymoon until Brady's punishment was repealed, according to The Globe.